﻿﻿﻿﻿﻿﻿﻿McKinney Falls is recovering from 2013's damaging deluge. McKinney Falls State Park is an urban treasure. Nestled along a scenic stretch of Onion Creek in southeast Austin, its abundant wildlife, gushing waterfalls and historic ruins attract people from all walks of life. The park’s serene beauty makes it the perfect escape from the hustle and bustle of Texas’ rapidly growing state capital. This peaceful existence was interrupted, however, when the park became the scene of a historic natural disaster — the Halloween Flood of 2013. 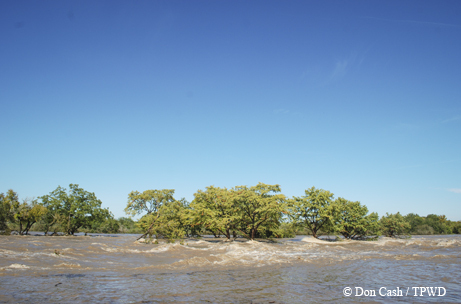 That day, Onion Creek rose 41 feet from its banks and flowed at 120,000 cubic feet per second. All of a sudden, this little tributary of the Colorado River was a raging river flowing with nearly twice the force of Niagara Falls. By the time Onion Creek returned to its banks, park Superintendent David Shirley was already busy coordinating damage control and cleanup. The Smith Visitor Center, which overlooks the Upper Falls, was inundated with five feet of floodwater. Debris covered hiking trails and picnic areas all along the creek. In addition to damage at the state park, the flash flood damaged or destroyed 1,200 homes along Onion Creek and took the lives of four people. “The hardest part was having to close the park to campers for nearly two weeks,” Shirley recalls. The waters of Onion Creek flow through McKinney Falls State Park in Austin, and in October 2013, those waters were raging, thanks to a torrential rainstorm that flooded parts of the city. 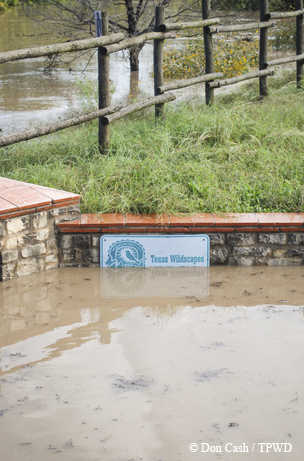 The park’s visitors center was flooded, and trails and picnic areas were covered by debris. The campground and most trails are open while work continues on renovation and flood planning. While the Halloween Flood was the biggest in the recorded history of Onion Creek, catastrophic floods are nothing new. The previous flood of record occurred in 1869, when the creek rose approximately 34 feet, a little below the Halloween Flood. Thomas F. McKinney, for whom the park is named, was an entrepreneur who helped finance the Texas Revolution. After building his fortune in Galveston, he built a retirement homestead on Onion Creek. He planned to spend his retirement at his ranch breeding racehorses and spending time with his family. Always industrious, he built a gristmill near the Lower Falls, one of the first such mills in operation in the Austin area. The 1869 flood destroyed the mill, causing a financial ruin from which McKinney would never recover. Like the 1869 flood, the Halloween Flood left destruction and heartache in its wake. But unlike Thomas McKinney, the state park that bears his name will soon recover from the devastation and emerge stronger than ever. Renovation and planning are underway to ensure that the affected areas of the park will be available for generations to come. In the meantime, all campground facilities and most trails are open for you to enjoy. McKinney Falls State Park is located within the city limits of Austin, about two miles west of Austin-Bergstrom International Airport. For more information, call (512) 243-1643 or visit www.tpwd.texas.gov/mckinneyfalls.